From bad fabrics (that'd be Máxima and Maria Teresa) to bad shapes (Mathilde and Alexia), these ladies brought me down with their unfortunate selections. Designers make me sad, too: example being when NATAN attacked poor young Princess Alexandra. And when Sarah busted out her Alexander McQueen...it made me weep for the memory of that poor designer. Have some respect for his legacy, Sarah: retire that dress. That's enough of the sad. Let's get back to the humorous appearances, shall we? It's the bolero and the hair piece on Elena that takes this pink number from just enthusiastically ball-gownish to straight up costume. Similarly, Princess Anne's outfit on Ascot Day 2 wasn't that bad...until you saw the hair ornaments. It's a little disturbing on a woman of Anne's age (not to mention a woman of Anne's persona). Even more disturbing, though, is this fortune teller get up of Princess Michael. Talk about your costumes! What's not a costume, of course, is Margrethe's floral raincoat - that's just who she is (shame she didn't bust out the matching hat, though). And I'm sadly afraid that these necklaces attacking Princess Claire might just be who she is. Yikes. A nice printed fabric, a lovely flow...just makes you yearn for the beach (or Woodstock). But on royal duty? Methinks not. At least we're getting a picture of where Elena might have gotten the inspiration for her clown pants. I have no explanation for Charlene, though. Let's just hope she'll have a better Armani experience come wedding time. Oh, prints went wild on the dance floor too this year. Margarita combined the ever-popular jail bird trend with a nice floral for a truly mind-boggling frock, while Princess Irene and Queen Beatrix went paisley (why?). 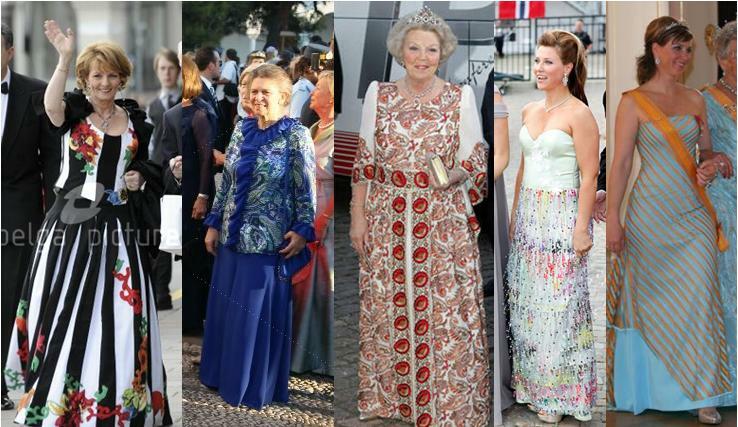 Märtha Louise, always one to give us something to snicker at, dished up two doozies this year: sea creature with a mullet at Victoria's pre-wedding dinner, and striped up like a football star during the Netherlands state visit. It should be noted that she's worn that dress before, to Frederik and Mary's wedding. She appears to only wear it when she has a sash that accentuates the stripe-age. Naturally, we close once again with Mabel. With stripper shoes...and a jumpsuit. Wait, why didn't this one make the countdown? Crap. Alright, you've heard me out. Now, tell me: who did I miss?